The North Harbor and the marina next to it is a very nice area, and within walking distance from the downtown area of Helsingborg, including Kärnan tower. Maybe 15-20 minutes or so at the most, depending on the exact docking location. The water that divides Sweden and Denmark is called Öresund. At the most narrow point of the Sound (about 40 kilometers north of Copenhagen), the twin cities of Elsinore and Helsingborg mark the entrance to the Baltic Sea. Historically, the two cities have always been closely connected because of their strategic placement. From ships anchoring in the Öresund, the passengers can enjoy the view of Kronborg, Hamlet's famous castle on the Danish side and the medieval fortress tower, Kärnan, on the Swedish side. More than 100 daily ferries make it very easy to go from one city to the other. Cruise ships berthing in the Helsingborg city area have a lovely view over the waterfront area with the city's new cultural house, housing almost 3,000 m2 exhibition area, the Dunker Culture center. 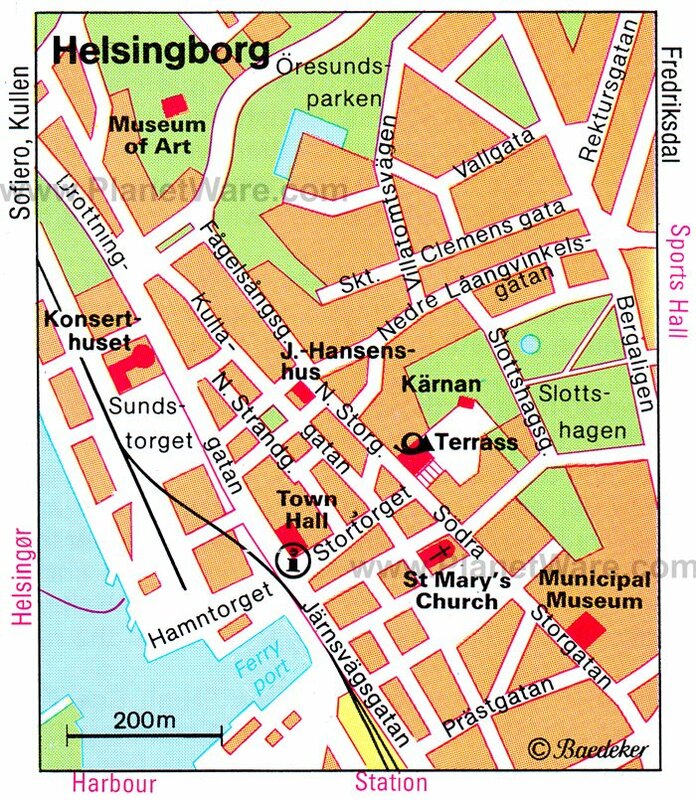 Helsingborg is small and is easily explored on foot. Take the 15 minute ferry ride across the sound to Helsingor, Denmark to see the Kronborg Castle and the cute little town. If you have time, you can also take the train to Malmo, over and under the spectacular Oresund bridge, a short stop in Copenhagen and up the coast to Helsingor. Just outside of Helsingborg, you can visit Sofiero Castle and it's beautiful gardens (requires a short taxi ride). In the city center, there is an abundance of shops, museums and restaurants. There is a wide selection of items such as Danish porcelain, silver, amber and leather goods. Antique and second hand shops not only add character, but also offer unique findings for everyone with a keen eye. And yes...there is an IKEA.